Two new board positions were added to the AFL Canada board for mens and womens player representatives as a voice in national team programming..
focus areas of growth, development and promotion. Participation across the country has continued to rise, led by the growth of Women’s footy in Vancouver and Youth programs in Calgary. 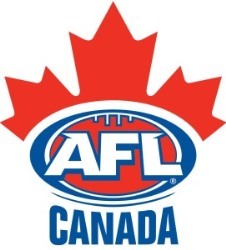 AFL Canada were able to grow the exposure of the game through increased engagement via online platforms and a new telecast agreement with CBC. As a result all IC17 Canada games were streamed digitally online through CBCSports.ca. As recognition for the work over the past two years the AFL has increased funding to AFL Canada allowing the employment of the first full-time staff in Bram Cotton.. Bram’s immediate focus is on assisting AFL Canada to be recognised by Sport Canada as a National Sporting Organisation. Following the 2016 Canadian Nationals and Training Camp, AFL Canada selected Men’s and Women’s National Development teams who toured London, The Midnight Suns finished with a 2-1 record, beating the London All-stars and the Great Britain Swans and falling narrowly to the Irish Banshees. The North Stars finished with a 1-2 record, being soundly beaten by the Great Britain Bulldogs and the Wandsforth Demons, but bounced back to beat the Welsh National team. In August 2017, Canadian National Teams travelled to Melbourne, Australia to compete in the International Cup. Williamstown Football Club were gracious hosts, offering their VFL facilities as a training base for the week prior to the tournament. Despite instigating new national trials Canada was unable to leapfrog other improving international teams. The Northwind lost a close opening game against the USA, before bouncing back to defeat the Great Britain Bulldogs. A loss to the strong New Zealand side and Nauru resulted in an 7th overall placing. Burnaby Eagles star Eric Klein was named to the World Team, one of the few very male players not based in Australia to do so. The Northern Lights overcame a scare from a tough Fiji in the opening game, escaping with a narrow one point win in a thriller. Wins against newcomers Pakistan, a competitive Great Britain and traditional rivals USA saw the Northern Lights fall agonisingly short to Ireland by two points in the Grand Final. Valerie Moreau was named player of the tournament with Lara Hilmi, Aimee Legault, Nicola Kirwan, Hilary Perry and Head Coach Jason Arnold named to the world team. At a participation level, AFL Canada had another year of overall growth, driven primarily by the AFL BC Women and Calgary Men and juniors. AFL BC Men, Edmonton and Ontario Women’s numbers were down in 2017 while Calgary Women, Ontario Men, Quebec and Nova Scotia were relatively flat. During 2017 and into early 2018 AFL Canada has been in touch new and potential new clubs with the Winnipeg Bears, Fort McMurray Magpies, Barrie Ballarats all looking to grow footy in their regions in 2018. AFL Canada are currently re-evaluating how they can better support new and emerging clubs to ensure that they are a catalyst for growth in new regions. AFL Canada were pleased to approve a number of grants in 2017, including; a grant for new goal posts for North Delta Junior AFL, Junior Footys for Edmonton AFC, and three new club grants to help the Vernon Roosters, Vancouver Vixens and Sydney Giants.